A children's author and illustrator is about to see one of her characters rocket onto our television screens. Mr Moon, created by Kate Veale, from Anglesey, will debut on the Disney channel this summer. The series is a collaboration between art director Ms Veale and animators in Singapore, London and Canada. She was inspired to create Mr Moon one evening in her back garden but it took 10 years for her to realise her screen dream. The series centres around Mr Moon, who looks after the night time sky with his best friend Silva Star, while Sunny takes care of the daytime. The series is educational and also has a moral message about the importance of looking after the earth. Ms Veale had the idea one night whilst sitting in a deckchair in her garden. "I decided to turn the friendly face of the moon into the face of a little man and give him a little moon suit - Mr Moon was born!" said Ms Veale, who lives near Pentraeth. 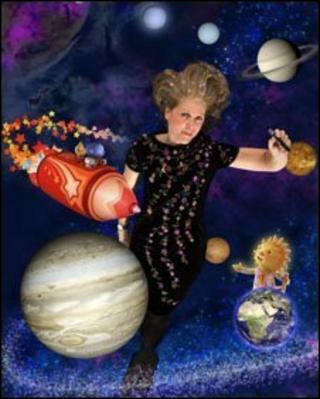 Ms Veale, who spent hours researching the night sky and the solar system, has even won the approval of experts at the National Space Centre for her character. She realised her idea had potential following a "lucky" meeting with a chief executive from Universal Studios at an international fair 10 years ago. "It's not usual to get an appointment at trade fairs but he obviously saw something in the character and he pointed me in the right direction, towards animation production studios," she said. "We had to raise huge sums of money and in the end it was a successful production between Great Britain, Singapore and Canada. Between the team we've made a fantastic animation series." Ms Veale's illustrations were first published in a story compliation book when she was just a teenager. She later went on to create the successful Country Companions and Oliver Otter series. "Even as a tiny child, I was completely consumed by drawing," she said. "I drew and painted all the time. I also read a huge amount right into the night - sometimes I would read until 4am. "I had one of those pull chord lights and I worked out how to pull it without making that clunk noise so my parents didn't hear! "I created children's characters and the world they lived in. "If I had been told that it would take 10 years of hard work before I saw any reward from the project, I would have carried on regardless. "I have always had an absolute belief in Mr Moon. Luckily right from the start a few key individuals could see the magic in the idea and the global potential." Ms Veale, who grew up in the Midlands and moved to Anglesey five years ago, likened the process of creating Mr Moon to being a composer. "You have the idea and know what it should look like, but you have to communicate what you have created to everybody working on it," she said. "It was very, very stressful but it's been the most amazing journey." And she said Wales is an inspiring place to work. "Wales seems to have a lot of exceptional talent in many areas," she said. "I think our film industry has a fantastic reputation globally. "Wales punches above its weight. The area I live in is inspiring." Mr Moon is coming soon to the Disney Playhouse in the UK and could eventually be shown globally. Ms Veale has the option to remain as art director on a second series but is also considering developing two or three other ideas. Mr Moon was created in collaboration with Sparky Animation Singapore, Skaramoosh London and Title Entertainment Canada.